China is entering the second stage of its colossal fight against graft. Nabbing high-profile culprits was a good start. Now, other miscreants have to believe the same could happen to them. Finally, the rewards for good behaviour must be made comparable to the spoils of wickedness. From here, things get tougher. Enough heads have rolled since Xi Jinping became president in March 2013 to prove that the crackdown is real. A retired general and three senior officials were ejected from the ruling party in recent weeks. Provincial heads, state company chairmen, ministers and bureaucrats – from “tigers” to “flies” – have been singled out for punishment. A campaign against banqueting and gift-giving has successfully spread the anxiety. But the bigger step is to show that purges aren’t driven by factionalism and personal grudges. So far, many cases have centred on allies of the former security chief Zhou Yongkang, who himself is under house arrest, sources have told Reuters. Investigations at broadcaster CCTV coincided with the network’s suggestion that a powerful state bank had facilitated money laundering. Harder still is introducing carrot to go with the stick. Civil servants in China are paid little relative to other professions – in some cases as little as $4000 a year. Their perks, such as healthcare and access to pensions, are considerable. But rather than cut those back, it makes sense for a socialist country to extend them to others. Paying state-owned enterprise bosses more, but making their appointment more competitive, is starting to be discussed seriously. The other challenge is to make sure the anti-bribery campaign doesn’t muzzle growth. Ungifted fine spirits and luxury watches won’t have much of an opportunity cost. But investment may suffer too. Even clean officials are holding back on some projects for fear that they might bring unwanted attention, or inadvertently facilitate speed payments. Lower spending, according to Bank of America analysts, might cut 1.5 percent from GDP that’s already growing at below the 7.5 percent government target. Tackle these three challenges and Xi will be well on target. Real cultural change will take years, because it requires the building of institutions that people trust to be honest and efficient. Happily, that is further down the to-do list. A combination of file photographs show then PetroChina Chairman Jiang Jiemin attending a news conference announcing the company's results in Hong Kong March 25, 2010 (L), and then Congress spokesman Li Dongsheng answering a question during a news conference on the eve of the 17th National Congress of the Communist Party of China (CPC) in Beijing October 14, 2007. Chinese authorities have begun criminal investigations into three former high-ranking officials over corruption allegations, state media said on July 14. 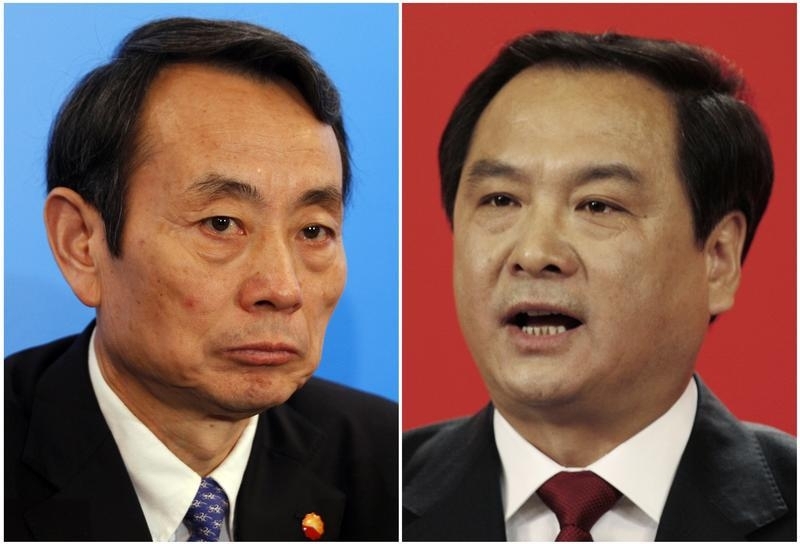 Two of them were allies of the powerful, retired domestic security chief Zhou Yongkang. Sources previously told Reuters that Zhou has been put under virtual house arrest while the ruling Communist Party investigates him for graft, though the party has made no announcement about his case. Combating corruption has been a stated goal of China’s President Xi Jinping, since he took power in March 2013. The three new investigations are into former Vice Minister of Public Security Li Dongsheng, Jiang Jiemin, who was the top regulator of state-owned enterprises for five months until last September, and Wang Yongchun, who was a vice president of China’s biggest oil company, China National Petroleum Corporation, the parent of PetroChina. Prosecutors detained a top Chinese news anchor shortly before a nightly broadcast on July 11, state media reported the following day, as authorities extend anti-corruption efforts deeper into the country’s media industry. Rui Chenggang is the popular host of financial news programmes on China Central Television (CCTV). A former top military general, Xu Caihou, was expelled from the Communist Party facing charges of graft, the Xinhua news agency reported on June 30. Xu had been the vice chairman of the Central Military Commission, which oversees China’s army.